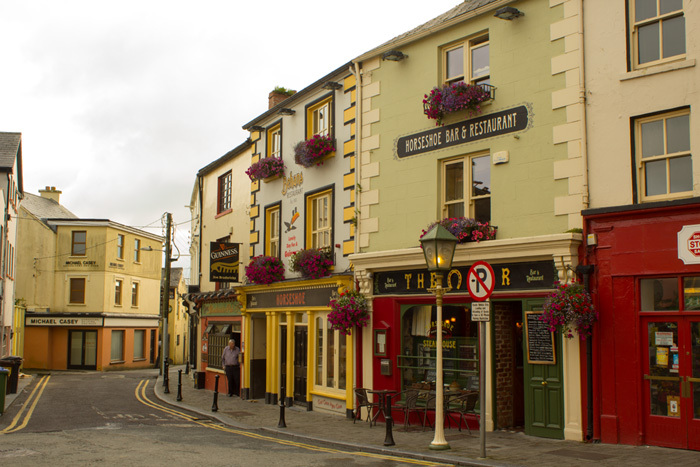 On the last leg of our journey along Ireland’s Wild Atlantic Way, we traveled around the Dingle Peninsula to the town of Tralee. On this leg, we leave Tralee and head into North Kerry, before crossing on the ferry to County Clare, around the Loop Head peninsula and finishing up in the town of Kilkee. I hope you’ll join us on the way – as we share the sights, culture, history and surnames of the areas we pass through. Coming into the town of Tralee – the administrative capital of County Kerry – my mind always goes back to the Rose of Tralee festival. Specifically to the early 1980s and heading down to Tralee for the craic, sleeping only when necessary and wherever possible. Funny how those memories can colour your impressions of a place! Like to add your Tralee Surname to our list? Just signup for your free weekly Letter from Ireland by clicking here. We drove on from Tralee the nearby villages of Fenit and Ardfert. This is the territory associated with Saint Brendan the Navigator. Saint Brendan the Navigator in Fenit, County Kerry. Brendan was born in Fenit in 484 AD and was ordained a priest in 512 AD. He founded a number of monasteries including Clonfert in modern County Galway as well as monastic cells at Ardfert. 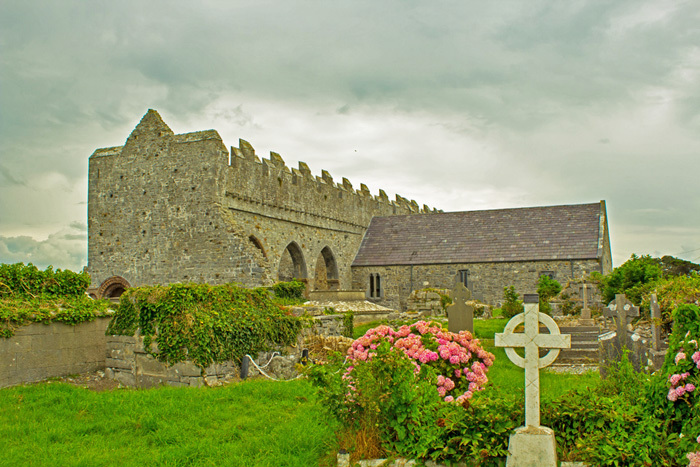 He also built monastic cells at Shanakeel at the foot of Mount Brandon and it is from here that legend has it he set off on a famous seven-year voyage that was written about in The Voyage of St Brendan the Navigator. It is believed that he made his way across the Atlantic in a closed sailing currach to what is now Newfoundland. This voyage has been retraced successfully by Tim Severin in the fascinating Brendan Voyage. Moving along, we arrived in the nearby village of Ardfert – which actually translates from the Irish as “The hill of the miracles”. 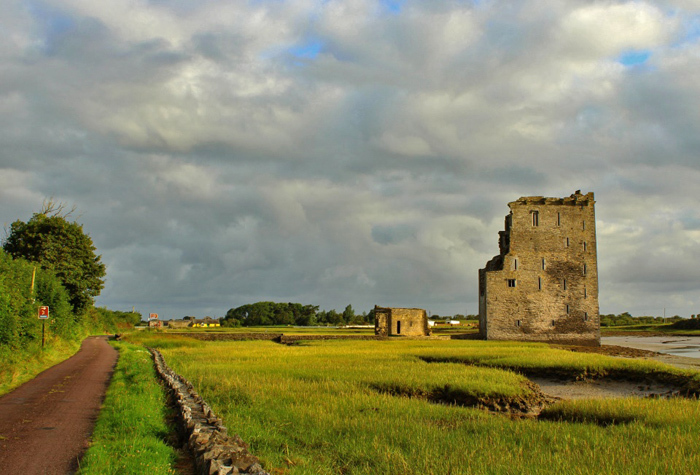 Ardfert was an area settled by Saint Brendan – in a territory ruled by the O’Leen family – and a cathedral was subsequently built over the original monastic settlement. The Normans arrived in the shape of the Fitzgeralds/Fitzmaurices who ruled the area to the 1600s. There are many Norman surnames in the area today – in particular Fitzgerald, Fitzmaurice and Cantillon. The countryside is fertile and quite flat as we head north towards the seaside towns of Ballyheigue and Ballybunnion. 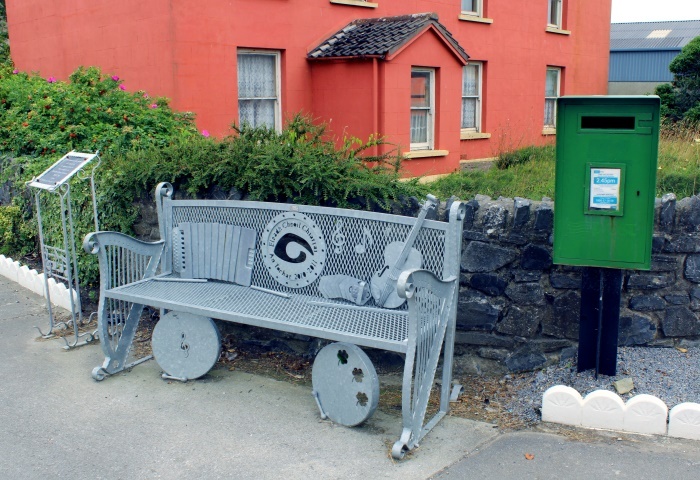 A musical chair in Causeway, County Kerry. 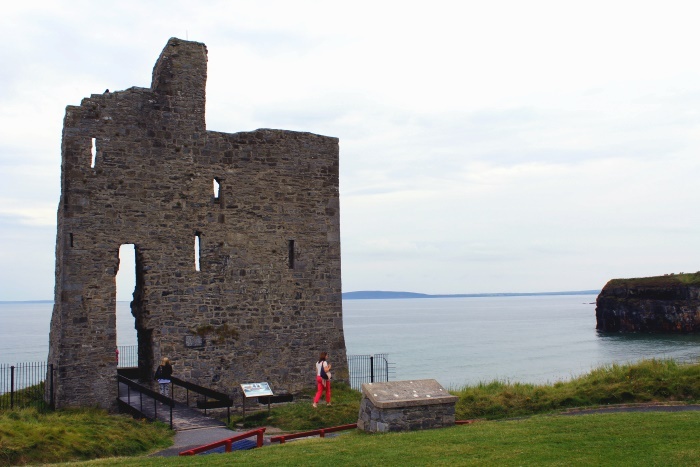 Ballybunion is a seaside destination for Irish people from Limerick, Cork and Tralee – plenty going on for the teenagers! Unfortunately, our teenager years are behind us – so we headed to our B and B for the night – just a little north of the town of Listowel. 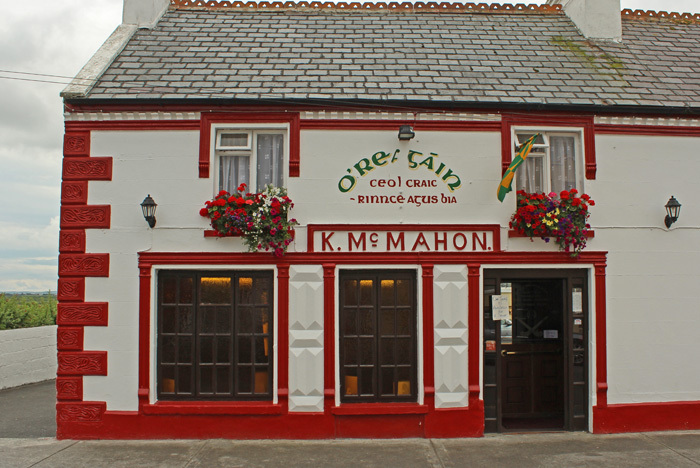 Half O’Regan – Half McMahon, Ballybunion, County Kerry. We stayed right on the mouth of the Shannon estuary, in easy reach of the Tarbert ferry to County Clare the next morning. Here is the view from our Bed and Breakfast – a chief viewing point on the Wild Atlantic Way – the main castle of the North Kerry O’Connors at Carrigafoyle. That night, the place to go was into the nearby town of Listowel. Famous for the many writers that it has produced, perhaps the best-known of all was the playwright John B. Keane. 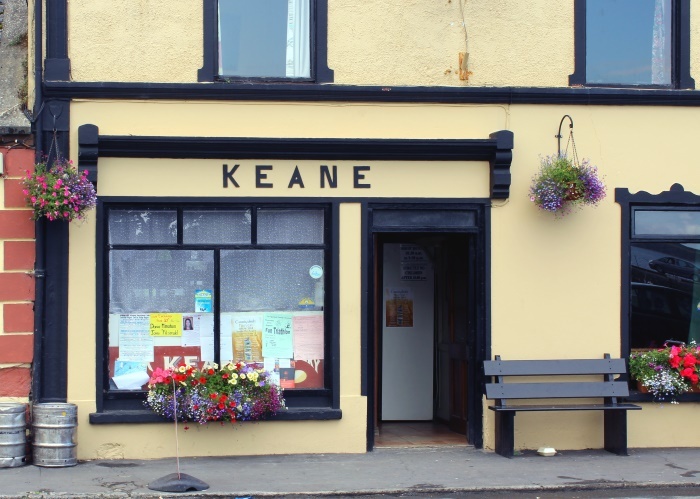 John B. Keane‘s Pub, Listowel, County Kerry. This is the front of his actual pub – a quiet, old-fashioned place where John B. used to hold court (and get a lot of ideas through the conversations) when he was alive. It’s a great place to visit, but you do miss him when you call in these days. 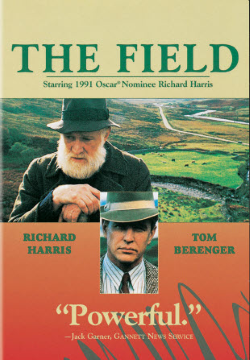 Probably his most famous, and most powerful, play is “The Field” which was also made into a film starring Richard Harris. Harris was also from nearby Limerick, just a few miles up the road – small world! Today, the town has a very refined look about it – you can see the prosperity that rolls in from the surrounding fertile countryside. A Streetfront in the Town of Listowel, County Kerry. Around the Loop Head Peninsula to Kilkee. 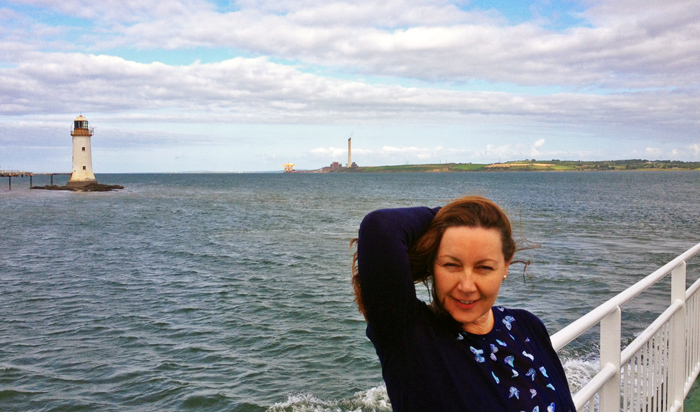 Crossing the Shannon on the Tarbert ti Killimer Ferry. 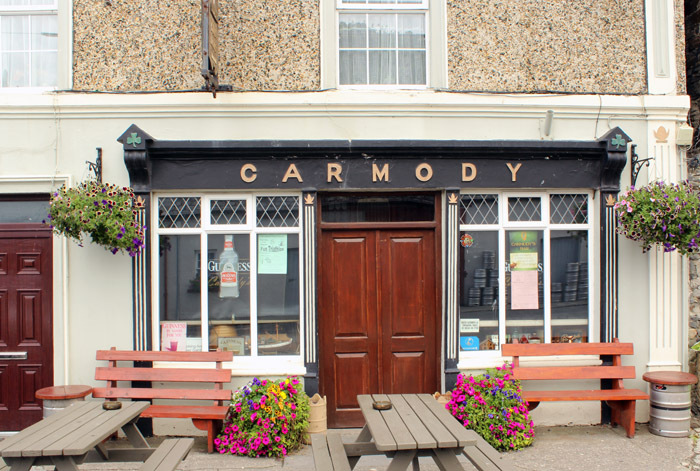 As soon as you drive off the ferry and head to the town of Kilrush – it feels very different to north Kerry. A lot more people about – and a lot more tourists (which is not all that much – this is Ireland after all!). 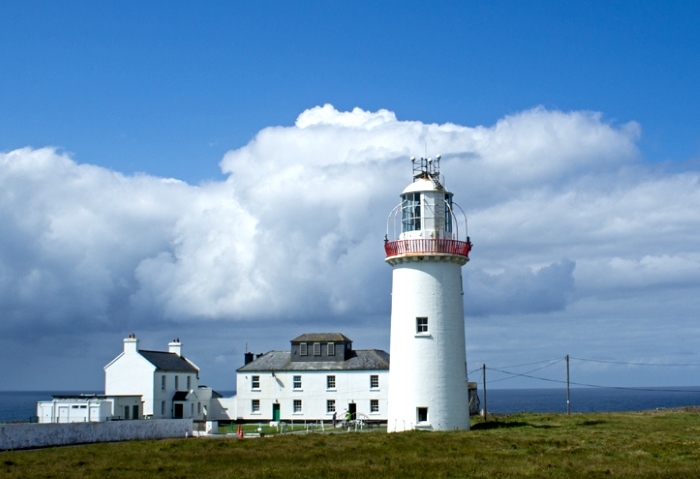 Our destination was Kilrush and the towns and villages of the remote Loop Head Peninsula. Stopping off in Kilrush for a cup of coffee, this memorial in the centre of town grabbed our attention. It was erected in 1903 by Irish nationalists – at a time when the area was still occupied by British troops. When they were leaving in the early 1920s, the memorial was shot up by these same troops as a parting gesture. 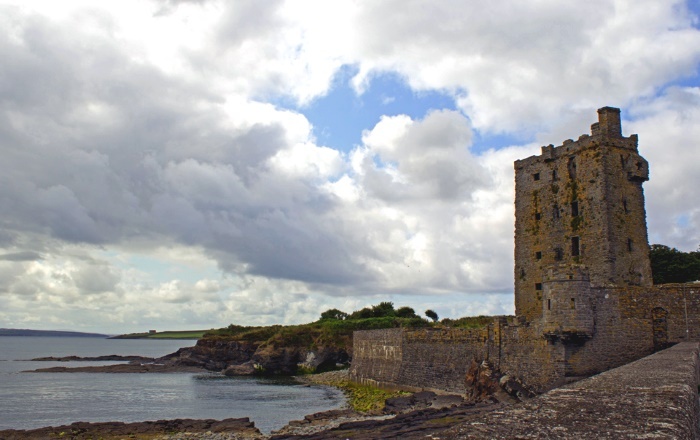 Carrigaholt Castle, County Clare – Built by the McMahons. This is the part of the world dominated for centuries by the O’Briens of the Dal gCais tribe – as well as their cousins the McMahons and many more. 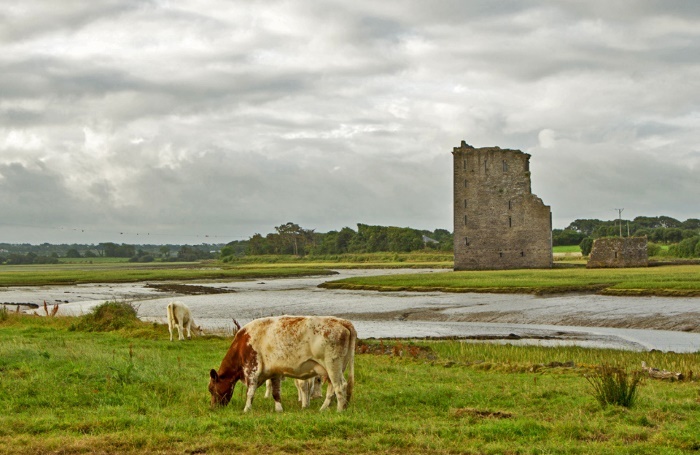 In Carrigaholt, we came across this scenic ruin – once a local stronghold built by the ruling McMahons, taken over by the O’Briens and finally settled in by the Burtons. 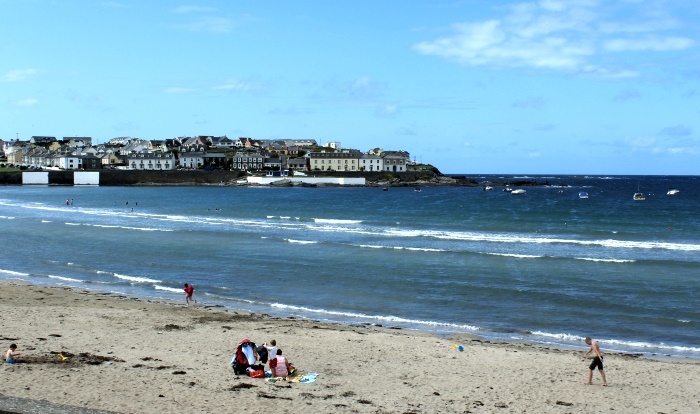 All around the peninsula brought us in to the busy seaside village of Kilkee. It was a warm afternoon, and the promenade and steps were full of families and day-trippers from nearby Limerick City. That’s it for this leg of the journey. Join us on the next leg as we leave Kilkee – heading north along the County Clare and Galway coastline – until we end up in the mighty Galway City. If you would like to see all of the legs of the Wild Atlantic Way that we have completed so far, click on “Join us on a Long, Slow Trip along Ireland’s Wild Atlantic Way“. Loved following your footsteps but disappointed that you stopped short of Lisdoonvarna where my Davoren ancestors hail from! Hi Lynn – to be continued shortly! We’ll get to the Davorens eventually! Mike. Mike, Each Sunday I get to read and enjoy your letter, Thank you for that. I also look for a name that seems to be as little know as some of the others you have mentioned in you stories. As you see I spell it O’Laker…my parents spelled Olaker and I thought at one time when younger I heard it could have been Oldaker, the family name we all thought was ours and adored , not many others around and that was Ok. well wondering if its ever going to appear in your letters has gotten the best of me and hence my inquiry . Asking this question about a name that we were given and have recently found out was really just that, Given….as we searched for answers and links to the name we find that Troy Olaker ‘our grand father ‘ was born Troy Hatfield and took the Olaker name at 25 years old . Supposedly the son of Johnnse and Viola Hatfield….not married , but related of course. Anyway there was a reason this happened, what it was we can only imagine…but finding the origin of our name has not lead us anywhere. Thanks for your stories, letters and books…if you ever need your luggage carried on these trips, a day or two notice is all I need. Thanks for giving me the link to this. It’s very much in my Hanlon ancestors territory as my cousin has a farm in Asdee East. Previous members of the line came to there from further down in Causeway. Delighted you enjoyed it Ken – sounds like you know the place well indeed! Mike. Welcome to The letter from Ireland and thanks for sharing the Irish surname in your family. To help you get started ..
Hope this helps with your question – all the best, Mike. Sheila, we were aware of his impact on the town as we walked around. Sorry we missed mentioning it. Next trip!